With the advance of neuroscience, there are effective medication treatments for most mental illnesses. However, misunderstandings about psychiatric medications are common, causing unnecessary worry among patients and even failure to adhere to treatment. How do psychiatric medications work in our brains? Does medication control our minds? Are the side-effects of psychiatric medication serious? 1. How does treatment of mental illness work? 2. What are the common types of psychiatric medications? 3. Will an antidepressant make a person happy? 4. Can an antipsychotic remove the thought inside a person’s mind? 5. Can tranquilizers and hypnotics treat anxiety and sleep problem? 6. How to manage side-effects of psychiatric medications? 7. Why do doctors prescribe “poisons” to their patients? 8. Why should patients continue medications after recovery? 9. Do psychiatric medications control our minds? A mental illness is caused by damage on certain parts of brain, resulting in disturbed functioning of the brain cells, such as abnormal transmission of the chemical among brain cells. Such disturbance inside the brain manifests as mental symptoms involving cognitive function, content of thought, perception, emotion, behaviour and biological function (e.g. sleep and appetite) and impaired overall functioning of the person. Generally, psychiatric medications work by restoring balance of chemicals in brain. For example, an antipsychotic normalizes the transmission of a chemical known as dopamine, and therefore, makes delusion subside. Some medication might even promote the healing of brain. For example, an antidepressant works by restoring the normal transmission of a chemical called serotonin among the brain cells, as well as promoting the healing of damaged part of brain through a growth factor called brain-derived neurotrophic factor (BNDF). Common types of psychiatric medications include antidepressants, antipsychotics, mood stabilizers, tranquilizers and hypnotics, and anti-dementia agents etc. However, this traditional way of classifying psychiatric medications is actually imprecise. For example, the medications used to treat depression are also useful in treating anxiety disorders. Mood stabilizers, including lithium and anticonvulsants, are the main-stream medications for bipolar affective disorders; however, the new generation antipsychotics are found to have therapeutic effect on bipolar affective disorder as well. Antidepressants are medications which are used to treat depressive disorders. Currently, the common types of antidepressant include Tricyclics, Selective Serotonin Reuptake Inhibitors (SSRI) and Serotonin and Noradrenaline Reuptake Inhibitors (SNRI). The disease mechanism of depression is that there are damages on the parts of the brain which regulate mood, motivation, memory, sleep and appetite etc. One channel to such damages is a chronic exposure to abnormally high level of stress hormone which is toxic to the brain. In these parts of the brain, a number of chemicals, such as serotonin and norepinephrine, are important for functioning. The transmission of serotonin is disrupted in the diseased part of the brain, leading to malfunction of the brain. An antidepressant works by at least two ways. On one hand, it directly enhances the transmission of serotonin among the brain cells. On the other hand, it promotes the healing of damaged parts of the brain through a growth factor called brain-derived neurotrophic factor (BNDF). Stress hormone damages the brain by inhibiting the production of this brain growth factor, causing the brain cells to wither like the root of a plant drying up. So we can see that unlike a comedy which makes you happy directly, an antidepressant is not a “happiness-creating” agent. An antidepressant heals your brain so that you regain the capacity to experience happiness. It also helps you to regain the ability to think rationally, to sleep well and have energy, so that you are more able to solve the life problems which cause stress and depression. We can see that an antidepressant can be considered as a medication which heals and protects your brain against the damage from stress. 4. Can an antipsychotic remove a belief inside a person’s mind? Delusion is one of the key symptoms of psychosis. Delusion is a false belief held with absolute conviction despite lack of objective evidence and obvious violation of logic. Antipsychotic medication can relieve the symptom of delusion. To understand how antipsychotic can relieve a delusion, we have to know what abnormality in brain causes the formation of delusion. As human brain is the most complex organ in the body, scientists have not yet completely understood how the dysfunction in brain leads to all the symptoms in schizophrenia. So far, we have more understanding on the positive symptoms of schizophrenia which involves the dysfunction of a chemical, called dopamine, in the brain. In the brain, dopamine is one important chemical which allows our brain to give us the sense of “personal significance” and “drive” to something in the environment. To survive in an environment, the nerves in our brain release dopamine as appropriately as possible, so that we can reason something to have a personal meaning only when there is some objective evidence. For example, I see that now a man is holding a knife towards me, the dopamine activities in my brain give a sense of “personal significance” to this man; therefore, I have the correct belief that he is harming me. This belief is driven by what really happened in the environment. However, when dopamine is excessively and inappropriately released in the brain, the inappropriately released dopamine made a person have a wrong sense of personal significance towards things in the environment. For example, a person will consider every policeman on routine duty of parole in street to be searching him particularly (i.e. a delusion). The abnormality of dopamine release in his brain makes him so convicted on such belief that he is not subject to rational explanation and is behaving in reaction to this belief (e.g. dare not to leave home at all). Most antipsychotics work by inhibiting the excessive dopamine activities in the brain so that no more “abnormal personal significance” can be attached to things around the person (i.e. no more new delusion developed). After taking antipsychotics, the person will not immediately get rid of the delusion he has been having, but he will become less preoccupied on such belief and have less distress. He then starts to be able to take other explanations for what happens to him. For example, “I always come across policeman in street because there are police on patrol every day in public areas”. “They are not looking for me, because they do not arrest me after numerous encounters in public”. Some people may wonder if antipsychotic, or any other medication, can remove a certain belief in a person's mind, e.g. to stop his children from believing the words of his bad peers, or to stop his boss from believing the gossip against you. Antipsychotics can only help a person to get rid of a belief which is derived from abnormal chemical activities in brain. If a belief is not derived from brain abnormality, antipsychotics cannot help. Tranquilizers and hypnotics work by enhancing the activities of a chemical in brain called GABA . The action of GABA is inhibitory. Therefore, GABA action can lower the level of arousal of a person, relieve anxiety and promote sleep. However, tranquilizers and hypnotics cannot correct the underlying chemical imbalance which causes the abnormal level of anxiety and difficulty in sleep. Moreover, there is a risk of dependence after prolonged use of tranquilizers and hypnotics. The major medication treatment for anxiety disorder is SSRI and SNRI which correct the imbalance of neurotransmitters. Tranquilizers and hypnotics are limited to short-term use in anxiety disorder and depression. It is easily overlooked that sleep problem is common in anxiety disorder and depression. After anxiety disorder and depression have been treated, the sleep problem will then improve. Every medication, no matter Western or Chinese medicine, has numerous possible side-effects. Among these, only a few are common (i.e. in more than 10% of patients). In recent decades, the new generations of psychiatric medications have already improved significantly in side-effect profile. Some side-effects subside as the body starts to adapt to the medications. For example, some patients might have exacerbation of anxiety and appetite problems in the first week of antidepressant treatment; these symptoms usually subside gradually. There are also some side-effects which are amendable to some other methods. For example, the second generation antipsychotics have side-effects of increasing the risk of metabolic syndrome which includes high blood sugar, high blood lipid, high blood pressure and weight gain. Nonetheless, if the patient adopts a healthy lifestyle, e.g. having adequate exercise and diet control, the risk of having these side-effects can be lowered. It is important for patients to report to their doctors any discomfort after taking the prescribed medications. Doctors will judge whether the discomfort is a medication side-effect, a symptom of the mental illness or the symptom of another illness. Sometimes, certain side-effects are not avoidable. The doctor will discuss with the patient to decide on the plan of medication treatment, after balancing the risk of relapse and the harm of side-effects. Doctors can minimize the medication side-effects by adjusting the dosage and frequency of taking medications. It is unwise to totally refuse medication treatment due to fear of side-effects, because the doctors can always adjust the dosage and types of medication, or to stop medications, in response to the side-effects that the patients experienced. Many patients are worried about the red label “poison” on the package of the prescribed psychiatric medications. This label of poison means that it is a medication regulated by the Pharmacy and Poison Ordinance of Hong Kong, and this medication can only be prescribed by a registered medical practitioner. One common misconception about recovery in mental illness is about the role of medication treatment in maintenance. This misconception is common because in many other illnesses, e.g. pneumonia, the patient stops taking the antibiotics after the infection has been cleared. The recovery of the pneumonia is apparently defined by the stop of medication. For mental illness, even after the patient has all the symptoms subsided and has fully resumed his work and normal family life, in many cases, the psychiatrists advise the patient to continue the medication for a period of time ranging from months to years. 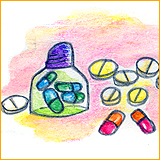 In fact, the use of medication to consolidate recovery is not unique to psychiatric treatment. In some cancer disease, even the cancer is at early stage and it has not spread, after a complete resection of the tumour, the doctor might let the patient to take a few months of chemotherapy to consolidate the recovery. Most mental illnesses are due to stress-induced damage to certain vulnerable parts of the brain. Psychiatric medication promotes the healing of the damaged brain region or normalizes the disordered chemical transmission in the damaged brain cells. After the brain function is normalized and the symptoms have all subsided, the underlying vulnerability which is largely due to genetic makeup still exists and poses risks of a relapse. Medication cannot eradicate this underlying vulnerability. Furthermore, the stressor which causes the last episode of mental illness would probably happen again and might trigger a relapse. Therefore, the role of maintenance treatment in mental illness is to consolidate the recovery by offering protection to the brain. In fact, many of us have been doing some extra protective measures in daily life to maintain health and to prevent another episode of illness. For example, some people are more easily to get sunburn so they choose to apply sunscreen lotion to avoid sunburn whenever they have outdoor activities. Some people are more easily to get a common cold, so they choose to wear a jacket whenever they go to a shopping mall or a cinema. The rationale of these measures is similar to that of continuing medication in maintaining mental health. Mental illnesses dispose a person’s control on his own mind. Medication treatment will not control the patient’s mind; instead, medication treatment functions as a tool which restores the normal activities of the brain and helps the patient to regain control on their mind. In contrast, illicit drugs, e.g. ketamine, amphetamine, damage a person’s mind and subsequently control the person’s mind.